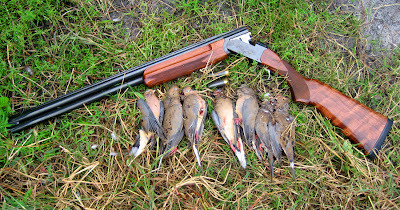 i went dove hunting this weekend. ive been out one other time this season but didnt take any pictures. i killed 8 birds (only 7 in the pic. added one after i took this photo) and should have had a limit with no problem. i missed about 6 "easy" birds. one just about landed on my face. jimmy edwards who was next to me got his limit by 4pm. stayed till 6pm so i probably missed my chance for a limit during that last flight dove like to make as the sun is setting. had a great time and plenty of dove flying. hopefully the next phase will have birds like this.